Waikato's week-long technology symposium, Techweek'18 Waikato, has been hailed a success by organisers, participants and attendees. Running from May 19 to 25, Techweek'18 Waikato hosted information and communications technology (ICT) and innovation-inspired events at Waikato Innovation Park and locations around Hamilton and the wider Waikato region. The Waikato event ran in parallel with the nationwide Techweek festival, organised by NZTech and supported by the Ministry of Business, Innovation and Employment (MBIE). According to the 2017 Technology Investment Network (TIN) report, Waikato is the fastest growing technology region in the country. 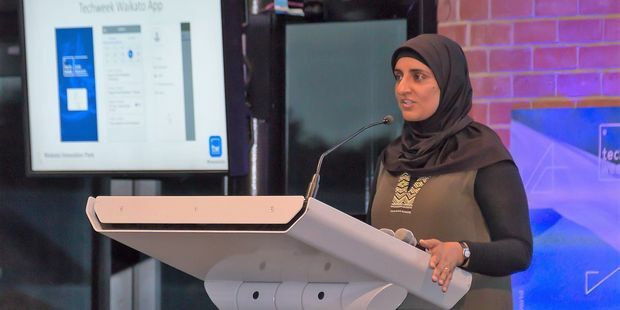 Waikato Techweek'18 project lead Jannat Maqbool says a key focus of the week was showcasing the breadth of technology talent and expertise across the region. "We had more than 1300 people join us at 21 events across the Waikato," says Maqbool. "We wanted to showcase the advantages of working in ICT in the Waikato region, and the depth of tech talent here. It's amazing how much creativity and innovation there are in small towns, and we can tend to overlook them for the bigger cities, so we made sure events in Raglan, Thames, Taupō and Paeroa were on the agenda." Maqbool says the featured event, the Internet of Things (IoT) tour, was a highlight among the Waikato events. The Internet of Things focuses on the connectivity between things — devices, appliances and machinery — and how data can be collected, analysed and shared to solve problems and drive innovation. Maqbool says the Māori Tech Showcase on Monday night at Wintec was another highlight. "We know the Māori economy in the Waikato is growing fast in a business sense, and it's also growing rapidly from an IT and technology point of view. "More than 400 people attended the Māori Tech Showcase, which shows the interest the sector is gaining, and how the use of IT and technology are being used to enhance Māori business activity and connect people to New Zealand's cultural story." Craig Purcell, business growth manager at Waikato Innovation Park and one of Techweek'18 Waikato organisers, says he's continually impressed by the brain power, connections and technology in the Waikato region. "The fact that we are part of the national Techweek shows we can be really proud of the quality and scale of events hosted in the Waikato region." "The sector is thriving and the more support and celebration we can give it, the better. The IT and technology sector in Waikato — and New Zealand — are growing rapidly and in the Waikato region we're well-placed to be at the forefront of that growth. "I suspect Techweek'18 Waikato is just the beginning of an ongoing celebration of the capabilities of both the region and the country."